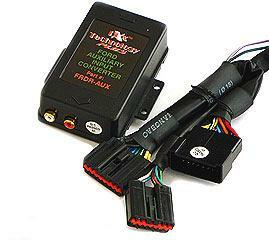 Pie FRDR-AUX Ford Taurus, Mercury Sable Auxiliary audio Input interface. 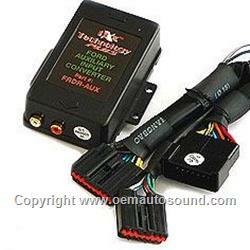 This auxiliary input Converter connects to the CD-changer data port of your factory Ford Taurus, Mercury sable amplifier rcu, to create an external auxiliary audio input source that has a pair of left and right RCA audio inputs. With this converter installed, you can connect any external audio device iPod/iPhone, Mp3, DVD player that has an audio output directly to your factory Ford Mercury radio without using an FM modulator or Fm transmitters the sound quality is CD crystal clear and lets you hear the audio from your factory Oem Taurus sable radio by pressing the CD button. Works on most ford radios with a CD button, if your vehicle is pre-wired for a Ford CD-changer use the pie FRDW-AUX This aux interface is also compatible with any ford Lincoln system with the RCU tuner amplifier pack.